This inspirational memoir traces the life of an extraordinary woman. Wangari Maathai was born in 1940 in a small Kikuyu community in Kenya. Throughout the memoir we watch Maathai’s life change and progress alongside Kenyan society. 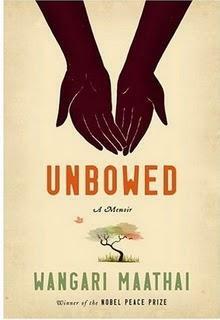 The memoir unfolds with stories of Kikuyu traditions and beliefs as a young Maathai plants crops alongside her mother. We see the influence that British colonization has on Kenyan society as European practices are adopted and cash crop agriculture replaces native plants. Maathai understands the value of Kenya’s natural habitat and how it must bridge Kenya’s past and future. Maathai’s life lessons culminate in her founding the Green Belt Movement. The Green Belt Movement and its aim to create a better future for Kenya blends the childhood lessons Maathai learned watching her mother work with the land, the ability to think critically and to ask questions which she gained while attending college in the United States, and the importance of valuing one’s culture that she learned while conducting research for her Ph.D. in Germany. Maathai’s aims in Kenya become increasingly political as she rallies for equal pay and benefits for female professors at the college where she teaches, stands up to the government when it attempts to destroy one of Kenya’s community parks, and stages a year long sit-in with mothers whose sons were political prisoners. Throughout the memoir, Maathai struggles to maintain peace both in Kenya and in her personal life. She withstands a humiliating divorce, multiple arrests and social stigma. This memoir, much like Maathai herself, honors Kenyan history and tradition while simultaneously planting the seeds of a brighter future for Kenya. Maathai’s perseverance and dedication to noble causes bring her allies both in Kenya and abroad, but it is a long journey before Maathai’s efforts are truly appreciated and honored in Kenya. After all of Maathai’s struggles, there couldn’t be a more beautiful ending to her memoir than to see her joy as she is honored with the Nobel Peace Prize.